← Delft Tiles, English Country Houses, Architectural Salvage, and Downton Abbey! This October, Winterthur is launching a new exhibition series, Eye on the Iconic. The concept behind Eye on the Iconic is to closely examine an iconic object. The first in the series is a well-known replica of Queen Elizabeth II’s coronation gown, which was used on the Emmy Award-winning Netflix series The Crown. This gown allows us to explore the design and iconography of the original and helps us to understand how it became iconic and what the significance is of a replica object. While the historical and cultural significance of the original dress is self-evident, this replica is interesting because it was created for the celebration of the queen’s jubilee and was used as a costume in The Crown. A literal icon, the replica invites us to look at why commemorative objects such as the dress and coronation souvenirs play such an important role in our experience and memory of historical events. Considering this question led me to wonder exactly how Ruth Wales and Henry Francis du Pont remembered their trips to England and their own encounters with the royal family. Their keepsakes and correspondence in the Winterthur Archives did not disappoint. H. F.’s papers in the Winterthur Archives include postcards from various houses and gardens he visited in England. 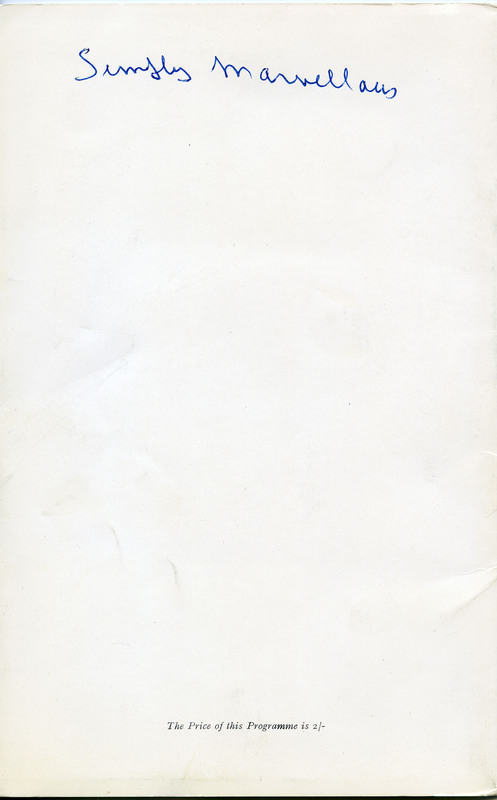 Some include notes on the back regarding what he saw. Among the social visits and trips to see various collections and gardens, the du Ponts also had the opportunity to attend some special royal occasions. Ruth recorded details of these events in her diary and letters. “Finally we heard the cheers of the populace and knew that the Royal couple were arriving at the Embassy. In a few moments Lady Lindsay and the Queen began a tour of the grounds and Sir Ronald and the King made a tour in a different direction. Everyone acted well, no one crowded around. All stood quiet and were dignified. The Queen is simply enchanting, so charming in manner, so pretty, such poise. Everyone was wild about her. She wore the most beautiful white dress imaginable and the way she raised her hand in greeting is a gesture too charming to attempt to describe. It is not a wave or a hail, but something between the two. In this letter Ruth acknowledges the American adoration of the royal family, a fascination that lives on today as Americans make a point of watching royal weddings, keeping up with the Duke and Duchess of Cambridge and their children, or marking the Queen’s 91st birthday. It seems that H. F. may have been just as enamored with the ceremony associated with England’s royal family. On June 13, 1959, the du Ponts attended the Queen’s birthday parade and witnessed the Trooping of the Color. 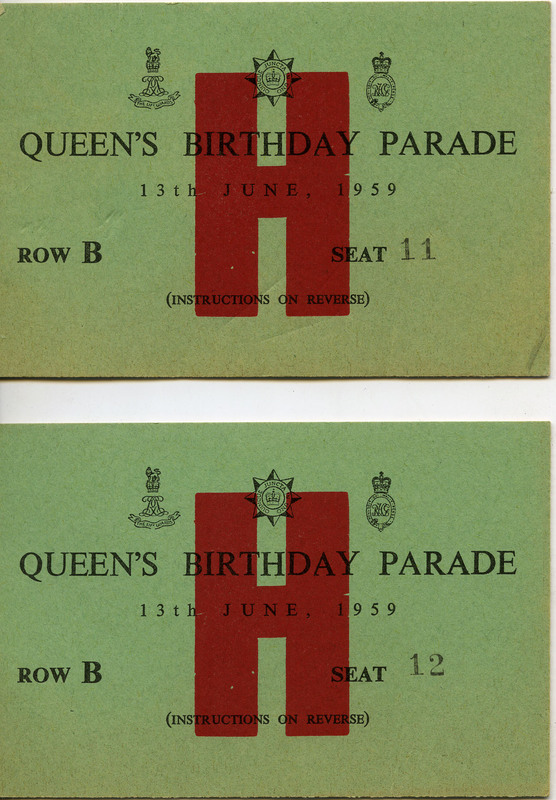 Among the treasures in the archives, I found the tickets and the program from the event as well as a separate booklet all about the Queen’s Guards. 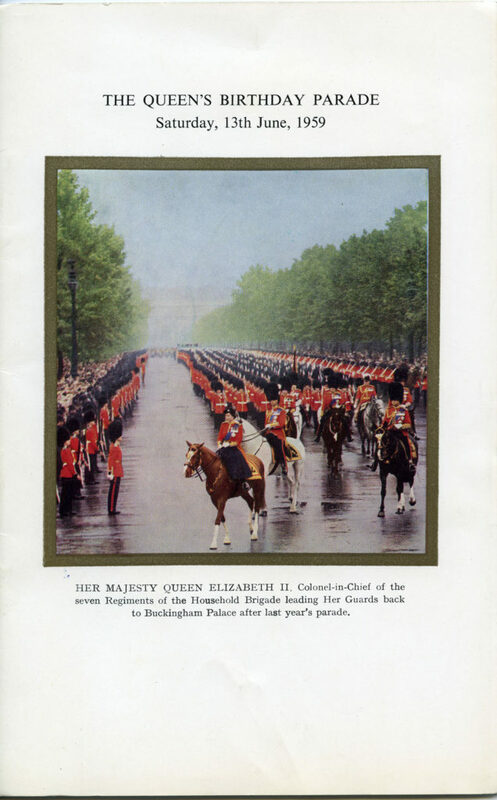 While the Queen’s actual birthday is April 21, it is in June that the people officially celebrate her birthday with the Trooping of the Color, a parade of the queen’s personal troops and a display put on by more than 1,400 men and officers, 200 horses, and 400 musicians from 10 bands and drum corps that play as one. At other times however, Ruth does seem to have found the pomp and circumstance of these royal events just as intriguing as H. F. did. A few years later when the du Ponts visited England, they attended an Order of the Garter Ceremony. 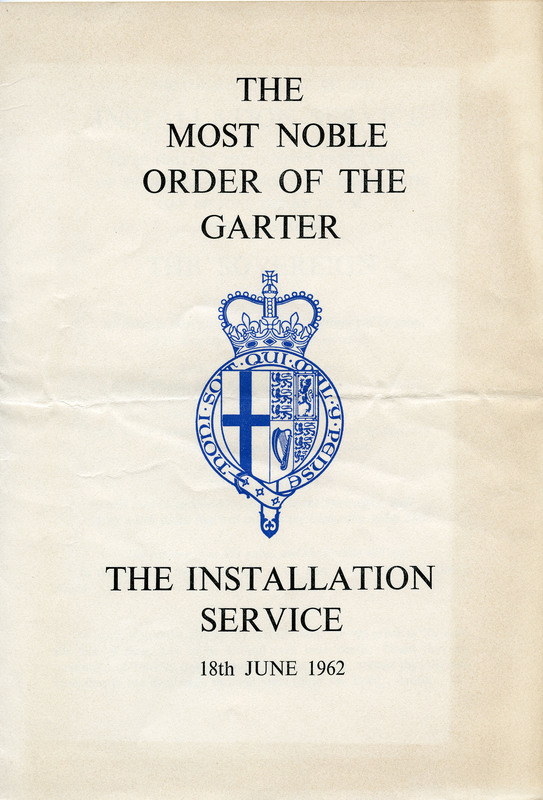 Tucked among the house and garden brochures and postcards that H. F. saved from the 1962 England trip, I found the program from the Order of the Garter service. With this fall’s exhibition of the replica coronation gown, we look at not only the fascination for the royal family that inspires shows such as The Crown, but also at the objects and memorabilia that are created to celebrate the Queen, such as this replica dress, which was originally displayed in a Harrods department store window designed to recognize the Queen’s Diamond Jubilee (a 60-year anniversary). See Royal Splendor: The Coronation Gown from The Crown, October 20, 2017–January 7, 2018, at Winterthur. British Orders and Awards. Kaye & Ward Limited, 1968. This entry was posted in collection, Ephemera, Library, Uncategorized and tagged coronation gown, eye on the iconic, H. F. du Pont, netflix, queen elizabeth II, royal spendor, the crow, Winterthur Museum Garden & Library. Bookmark the permalink.